Indian is a motorcycle brand that predates Harley-Davidson by a few years, but has struggled commercially. The brand was bought by Polaris in 2011. Eagle Rock Indian Motorcyle has filed a site plan to build a dealership in Idaho Falls at 845 Milligan Road. The 1.9-acre location is off Utah Avenue, just north of the Taylor Crossing on the River office buildings. Other than the address, the information on the business’ Facebook page is sketchy: “Eagle Rock Indian Motorcycle is a start up retail business for the sale and service and new and used Indian Motorcycle.” Efforts to reach the business owners are ongoing. Here’s a little bit about Indian Motorcycles, though. The company dates back to 1901, when bicycle racing promoter and former bicycle racing champion George Hendee of Springfield, Mass., hired Oscar Hedstrom of Middletown, Conn., to build gasoline engine-powered bicycles to pace bicycle races. Hedstrom completed the first motorized bike in May and shipped it to Hendee. The machine, and the other two bikes Hedstrom built in 1901, proved to be powerful and reliable, establishing the company’s reputation for outstanding performance. Later that year the company’s first factory was established on Worthington Street in downtown Springfield. As a brand, Indian was a longtime competitor with Harley-Davidson in the U.S. motorcycle market. Chiefs, Scouts, and Junior Scouts were all used in World War II, but none could unseat the Harley-Davidson WLA as the motorcycle mainly used by the U.S. Army. The company went bankrupt in 1953. In the years that followed, however, Indian’s legend was valuable enough for companies to want to revive the name. The latest iteration was formed in 2006, in Kings Mountain, North Carolina, where it manufactured Indian Chief motorcycles in limited numbers, with a focus on exclusivity rather than performance. 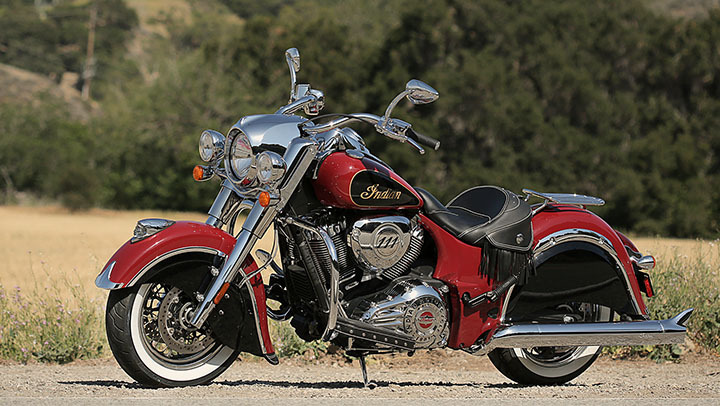 In 2011, Polaris Industries, parent-company of Victory Motorcycles, announced its intention to acquire Indian. The company’s production facilities were moved to Spirit Lake, Iowa, and in March 2013, Indian unveiled its new 111 cubic inches (1.82 L) "Thunder Stroke" engine and began to sell the newly designed motorcycles based on it.